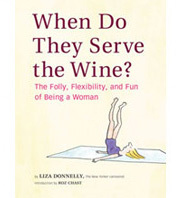 When Do They Serve The Wine? | About laughing at ourselves, and more. With this post, I am back– I took a leave of absence. Please visit my other blog on Medium to see some of the recent cartoons I have been drawing, and of course you can see a lot of my work on my website. 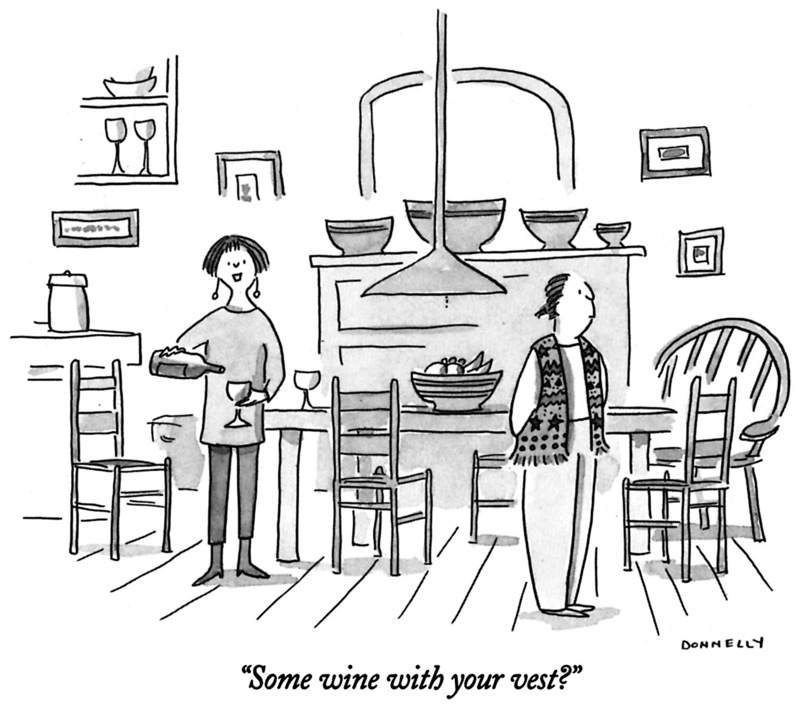 I drew this sketch a few days ago for my New Yorker’s Daily Cartoon submission. They didn’t take it, but I wanted to publish it anyway. It’s in response to the woman in Saudi Arabia recently who posted a video of herself in a mini skirt and subsequently got arrested. She was eventually released. While we in this country are aghast at what is policed re women in Middle Eastern countries, it is important to remember what Western countries do, and how they police what women should and shouldn’t wear. Women are told what to wear and if we are not wearing what a culture deems “correct,” we are “corrected,” so to speak. 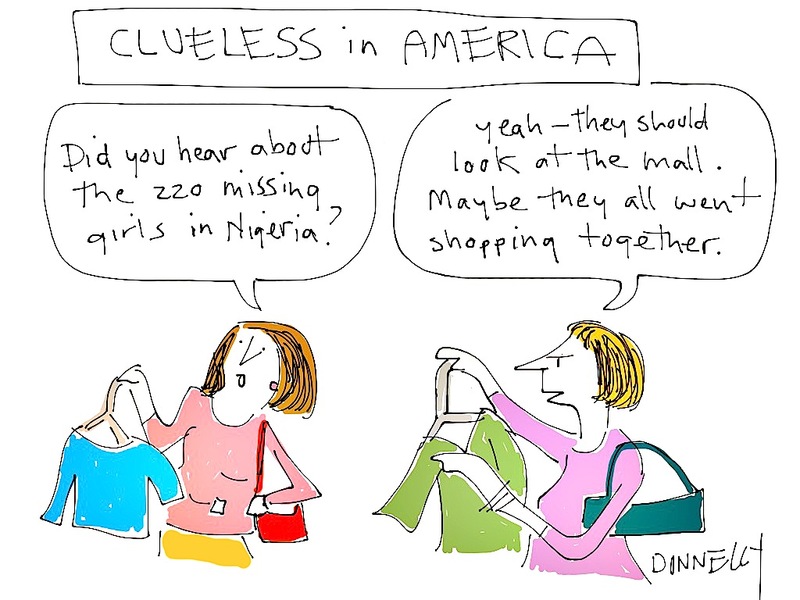 Society is beginning to notice how wrong victim blaming is, when a woman who is sexually assaulted while wearing a short skirt is — in many parts of the country — accused of “asking for it.” CBS News reported last week that in the US Congress, sleeveless dresses are not considered “proper business attire,” and thus women are open to being barred from entry if so clothed. In response, Representative Martha McSally wore a sleeveless dress in Congress, in violation of a rule that women are not to do so; and there was even more pushback. There are more examples, and many of them are much more subtle. 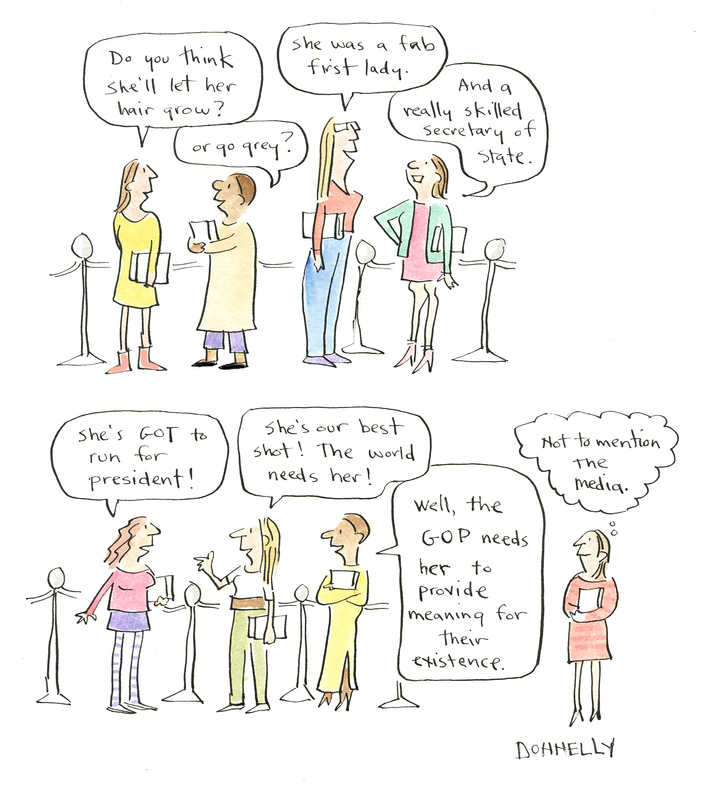 Every day is a political day for women around the globe. Here’s to more pushback. 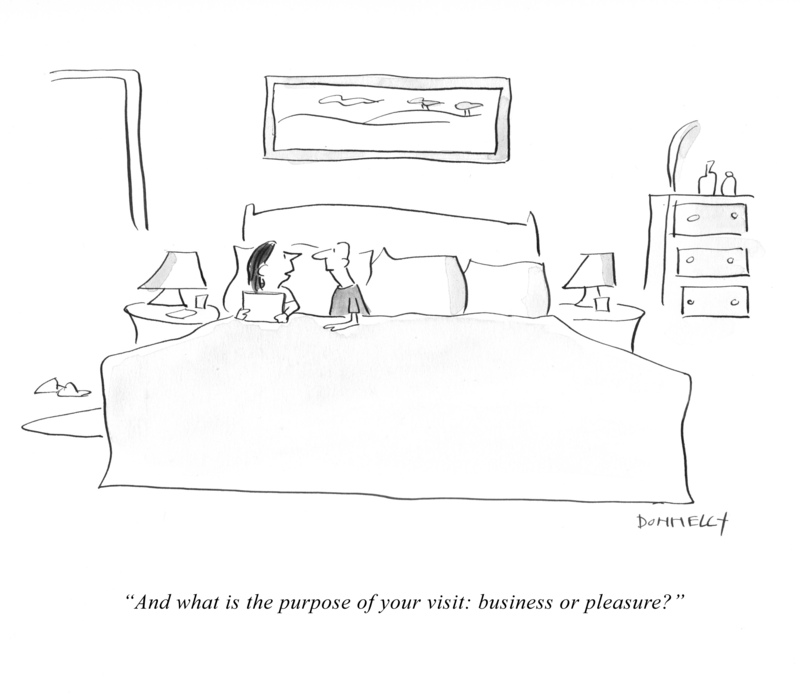 This cartoon originally appeared on Medium, a relatively new blog platform started by the by Twitter co-founders Evan Williams and Biz Stone. 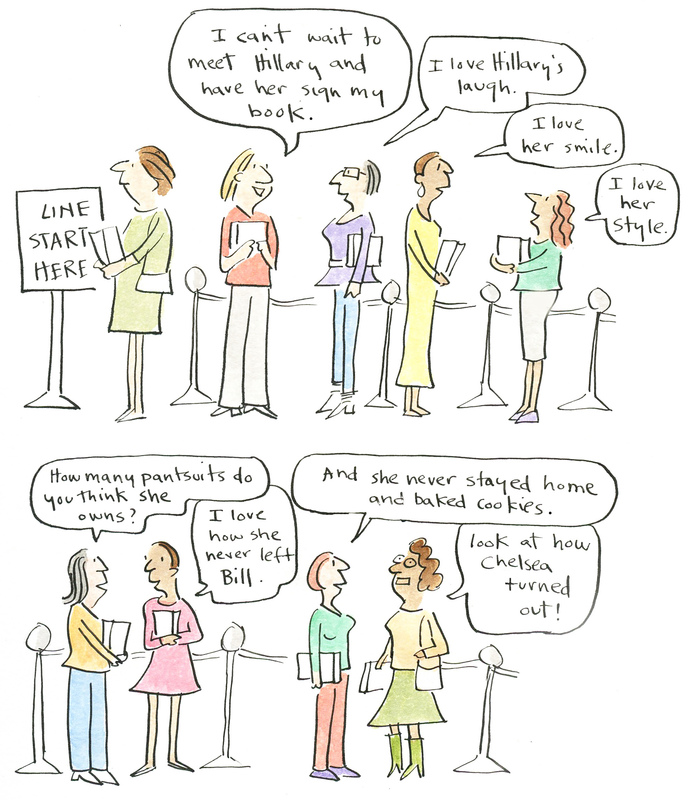 Every Monday morning, they publish a cartoon/comic of mine on politics for a section of Medium called The Nib. Go check it out! 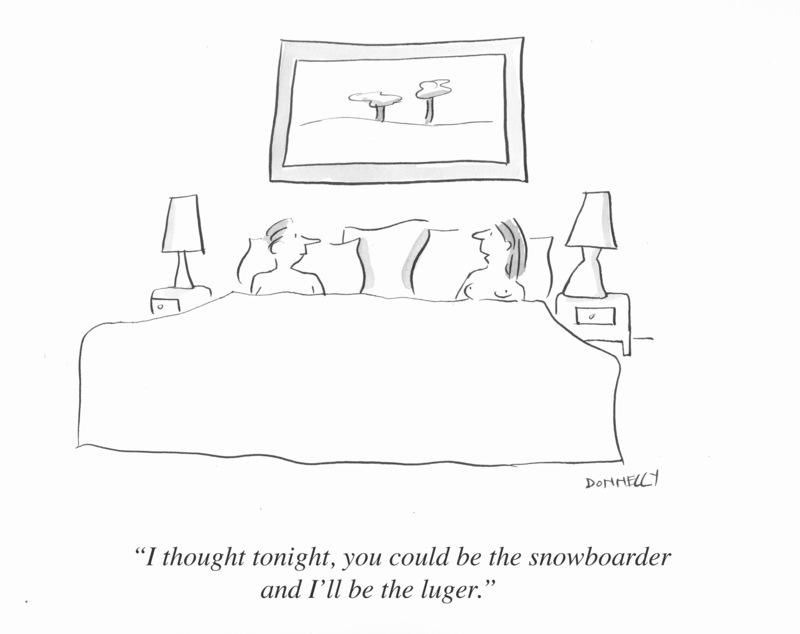 Lots of cartoons there all week long. I am not sure why the news story about how roughly 220 young women were abducted from a school in Nigeria is not more prominent in the American media. Cynically, I have a feeling it’s because, well, it’s not about us. We don’t get things, nor do we want to hear things, that aren’t about us. And sometimes the media just gives us what they think we want. I drew this quickly on my ipad. This story has been around for a few weeks, but I only learned about it a few days ago, and wanted to comment. I hope to do more ipad drawings here about the news, and other things of course. Relationships take a lot of communication. Because sometimes it’s hard to know what your significant other is thinking.. or wanting… or even doing. Sometimes, its best to just come right out and ask. 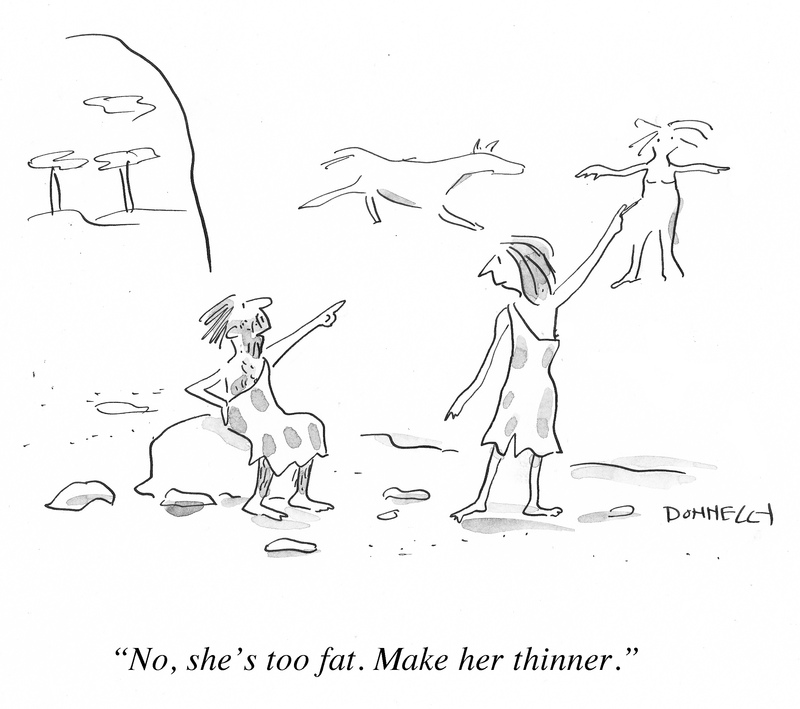 I have always thought that just because I am a woman, it does not mean I draw cartoons any differently than a man. But in a way, I may indeed be drawing “differently” simply because I know what it’s like to be a woman, and can draw about that. A man cannot. So when it comes to things about feminism, my perspective (and other women’s perspectives) provides a distinct view. And, frankly, one that has not been heard from enough over history. 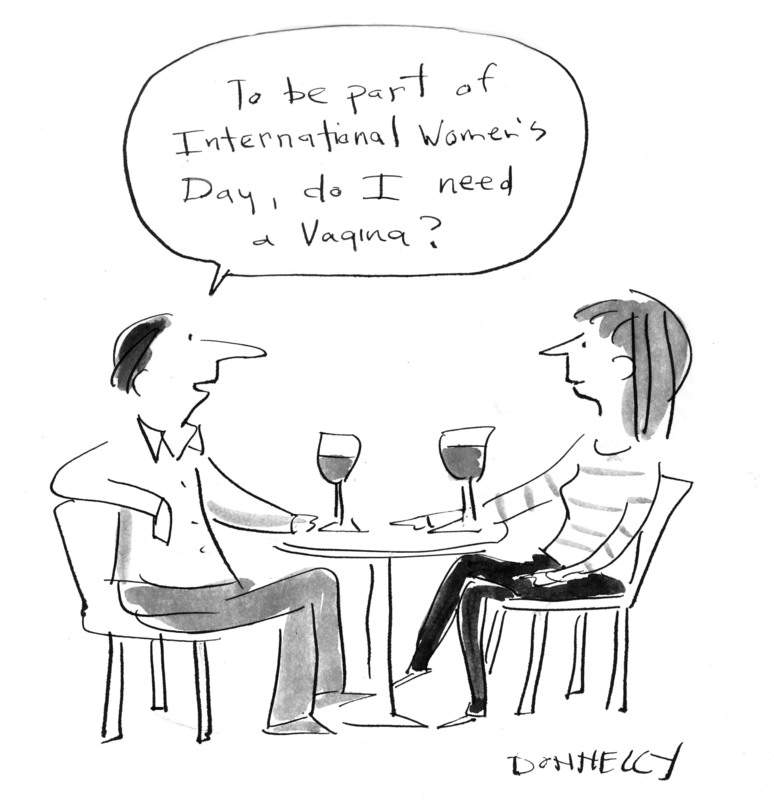 So, in honor of International Women’s Day, I post some my cartoons on feminism. A twitter follower friend said to me today “You do cartoons on this every day.” That made me happy, but I wish we didn’t have to talk about this anymore. With the Olympics over, we are all going to be operating in a void the next week (unless we watch both Idol and The Voice). 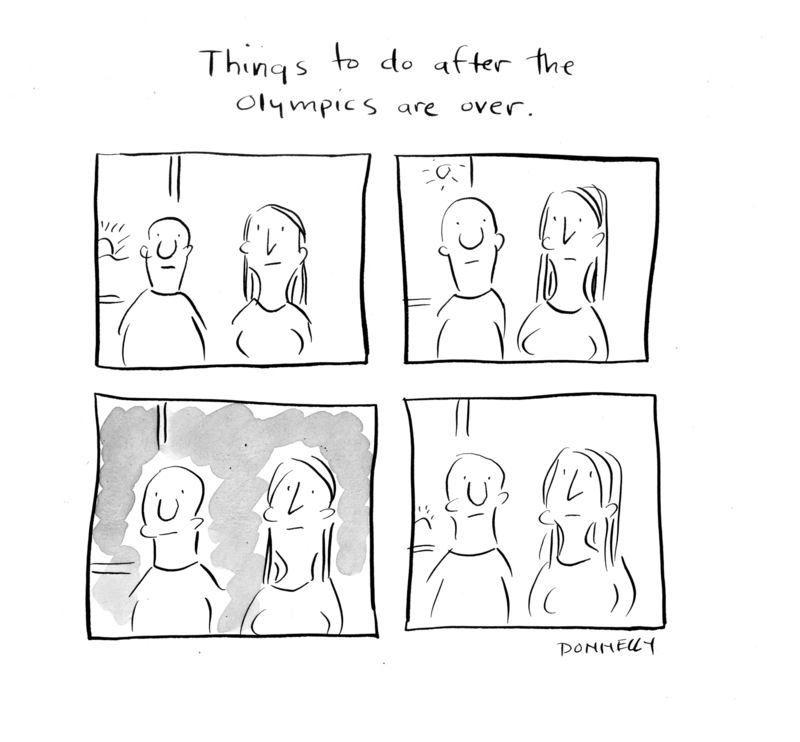 So I drew this cartoon. This is a case where I put the couple in bed and then said to myself, what is she saying to him? What’s going on in the world? I could have had her say something about Ukraine, or Justin Bieber or Hillary Clinton, or winter, St Patrick’s Day, etc. But I decided she wanted to say what she did. A lot of politicians and experts are speaking for the carriage horses in NYC. Will they remain in the city, is it inhumane? Are the horses abused? 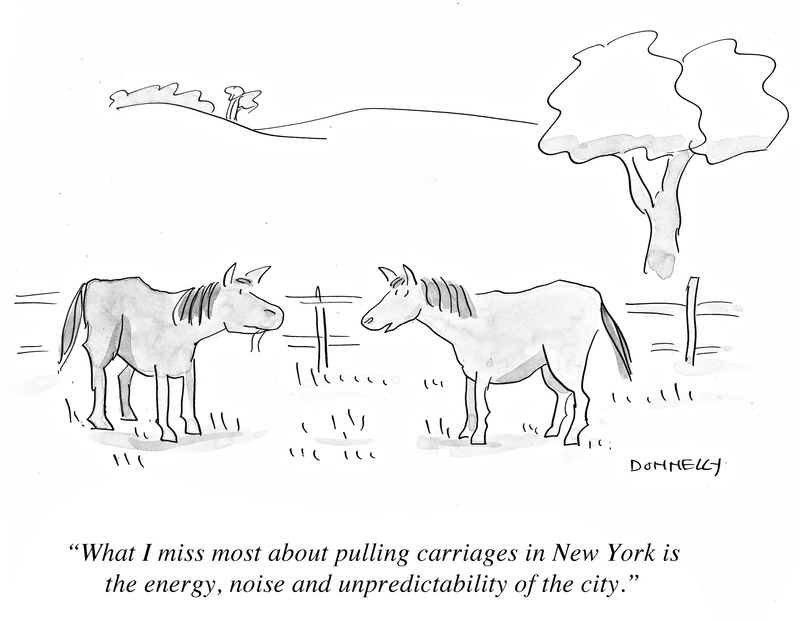 Do the horses dislike their life in the hustle-bustle of NYC? We don’t really know. As long as they are not underfed or overworked, get a vacation in the country on a regular basis, my feeling is that they are probably content.